Viewing a script’s output on screen is all well and good, but it’s often more convenient tell PowerShell to write the output into a text file. This a task for Out-File. Here we have a PowerShell instruction that you simply bolt-on to an existing script. ….. | Out-File “Filename.txt”. Incidentally, the simplicity of Out-File is one reason to employ PowerShell instead of VBScript. Writing the results of a command into a file is easy with PowerShell’s Out-File. The biggest danger is ‘over-think’; just remember that PowerShell takes care of basic file operations automatically. Consequently, there is no need to waste time looking for non-existent open-file, or save-file commands. If the file specified by Out-File does not already exist, PowerShell even creates it for you. … main PowerShell command | Out-File C:\ logs\result1.txt. This example is designed to concentrate on the Out-File command. In fact, the sooner we move on to example 2, the sooner we can do some real work. Note 1: While Out-File creates the file, you have to make sure that the path exists because Out-File cannot create folders. In this instance, you may wish to change D: \Files to an existing folder on your machine. This example has extra features, which make the script more useful. Thanks to the -recurse parameter, the script is designed to drill down into the subdirectories. The question mark ‘?’ introduces a ‘Where-Object’ statement, its purpose is to filter just the dll files. In this example the output contains only the two file properties that we are interested in: Name and CreationTime. Format-Table Name, CreationTime -auto | Out-File -filepath "D:\Files\dll.txt"
Note 3: The parameter -filepath is optional. If you omit -filepath, PowerShell’s intelligence deduces from the sequence of commands that “D:\Files\dll.txt” is the place to save the file. If there are no spaces in the path, then you can even omit the speech marks. Note 4: If you get an error message ‘Cannot find part of the path’, then amend D: \Files to a real folder on your machine. Note 5: I try not use the backtick symbol `, instead I ended line 2 with the | pipe symbol.. As a result PowerShell realizes that the command continues on the next line. Once I get a command to work, and I like it, I want to know more. Get-Help always reveals at least one parameter that I had taken for granted, forgotten, or previously overlooked, so it is with PowerShell’s write to text file. Note 2: Help Out-File -full also works. Be aware that there is no need for a pipe (|) with help. Out-File can be vicious in that it overwrites the file. Fortunately, Out-File has the -Append parameter so that you can just add the data to the end of existing entries. Note 6: You could add another -Append to the end of the Get-Date line. 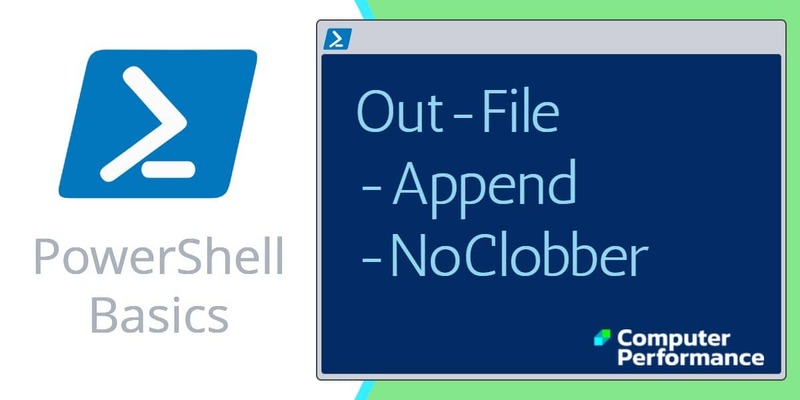 Note 7: If you insist on running the script again, the -NoClobber parameter causes PowerShell to generate an error message and thus protects the original file from being replaced. I like the Permissions Analyzer for Active Directory because it enables me to see WHO has permissions to do WHAT at a glance. When you launch this tool, it analyzes a user’s effective NTFS permissions for a specific file or folder, and takes into account network share access, then displays the results in a nifty desktop dashboard! With PowerShell v 2.0 you can output to a GridView. Spreadsheets are a convenient vehicle for importing and exporting objects into Active Directory. Begin by appending export-Csv to QAD scripts which list users or computers. In many ways this is the simplest technique yet. Just append the greater than sign >. However, the killer reason for redirecting the output of a PowerShell command is when you want to record error messages or warnings. Trust me; you will make great use of the ability of PowerShell to write to text file. Out-File is the perfect command for piping the results to a text file. This is a straight-forward command to bolt-on to existing cmdlets. The main danger for newbies is looking for non-existent commands; remember that PowerShell takes care of both opening and closing the named file. Thanks to Danny Beaman for correcting 3 errors on this page.